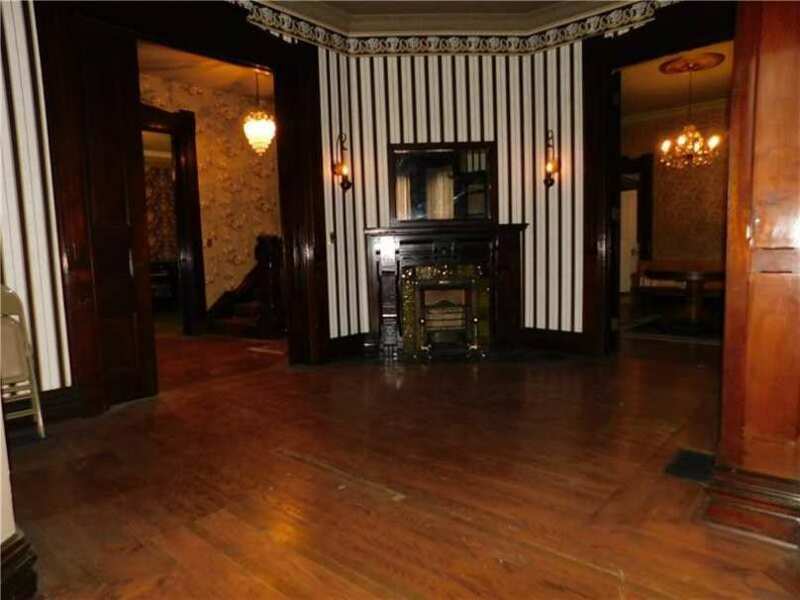 Amazing woodwork/floors/staircase/8 fireplaces/2 full baths in the 3 story home/building. Zoned commercial. Has been a residence/Funeral home, Lodge meeting hall. Newer bathrooms on first floor makes an office or buisness operation possible. Parking to the rear of the building. 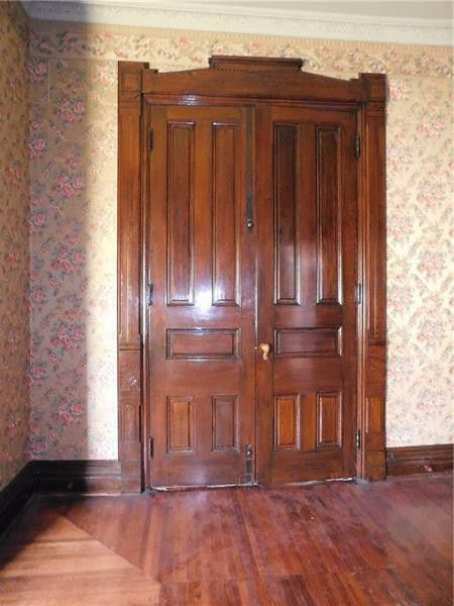 Interior doors are approx. 9' tall. Ceilings approx. 11'. 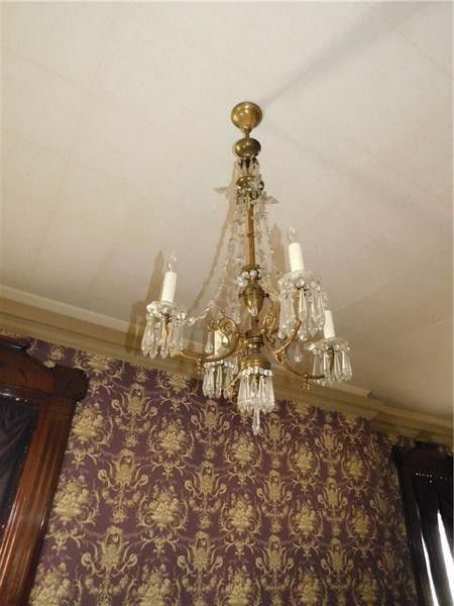 Light fixtures appear to be the original and have been converted from gas to elec. There is a kitchen and bath on each level. The upper floors had had some remodeling. 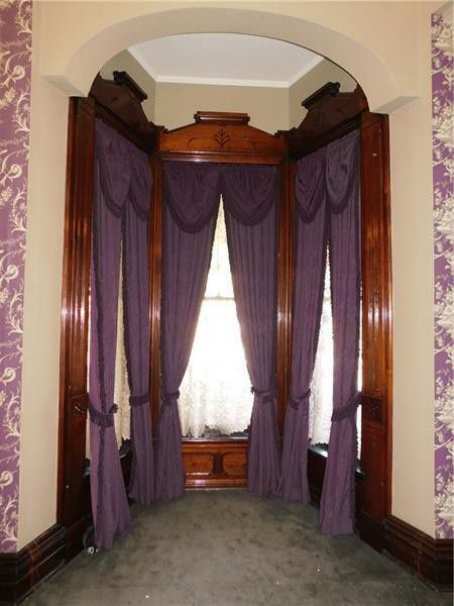 The history of this grand home is documentedl Add'l rooms Parlor M 16x19--sitting room M 8x19 - 2nd floor kit. 8x15--3rd floor LR 14x31--Kit. 9x13 plus storage rooms. Yeah you have nailed it, if you go to the street view you can see that slight overhang on the house left of it in both photos. Well done. You are very, very clever!!!! Must have been a popular post card. A clear version from 1918 is offered for a mere $3.25 (free shipping) https://www.ebay.com/itm/Vintage-US-Postcard-Residence-Section-Main-Street-Greenville-PA-1918/173598067544?_trkparms=aid%3D222007%26algo%3DSIM.MBE%26ao%3D1%26asc%3D20160323102634%26meid%3D35c22d0e3df54b278adedbee4593e72f%26pid%3D100623%26rk%3D4%26rkt%3D6%26sd%3D352508514826%26itm%3D173598067544&_trksid=p2047675.c100623.m-1 It wouldn’t be a bad choice to feature this post card as a Friday discussion subject image. (the copyright should have long expired) Very impressive Second Empire style house here. A bit faded, to be sure, and there are some more recent changes but what remains of the original house is impressive. A new owner with adequate resources could have the tower reconstructed based on old photographic evidence. I still find the present facade architecturally amazing because it has so many changes in rooflines including a rare Graham gable. (a mansard roof in cross-section) Obviously, the house was designed by a talented architect or perhaps from a published design? Perhaps best of all is the price…I doubt one could buy the materials alone for the offered price. Can’t find much on this one. Seems to have been built for English born clothier Thomas C. Gibson (1847-1932) who lived here for many years with wife Lizzie Kern and family. As the postcards show, there were a few fine homes on this block, including the Queen Anne next door built for the family of merchant and banker William Achre. 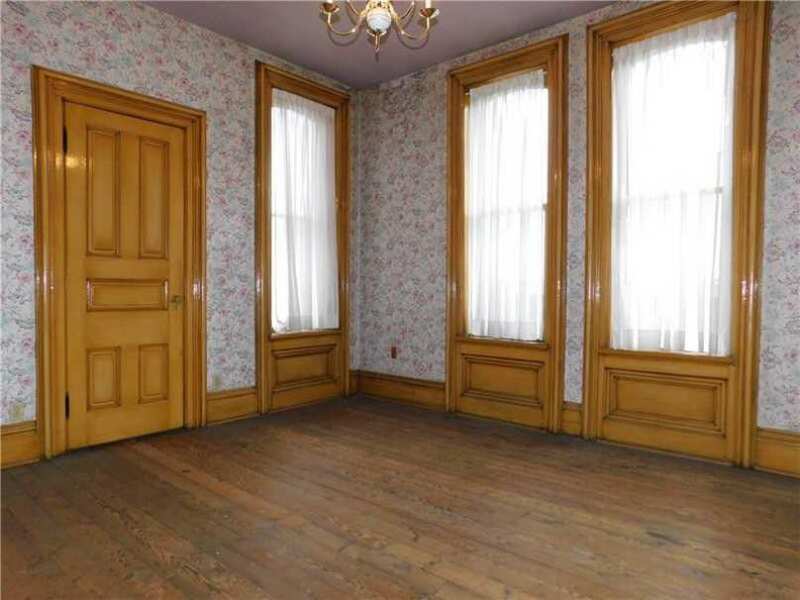 The realtor says it’s documented – would be interesting to know what they have. I wonder what family the M etched in the glass over that door, is for. Those doors looked later to me, maybe installed for the funeral home, but I don’t know for sure. My father did work for him and built the addition on the back for the upstairs family residence. Boy this one is a treat! So much still there to work with! Nice to see the postcard views so you have an idea of what needs to be put back. 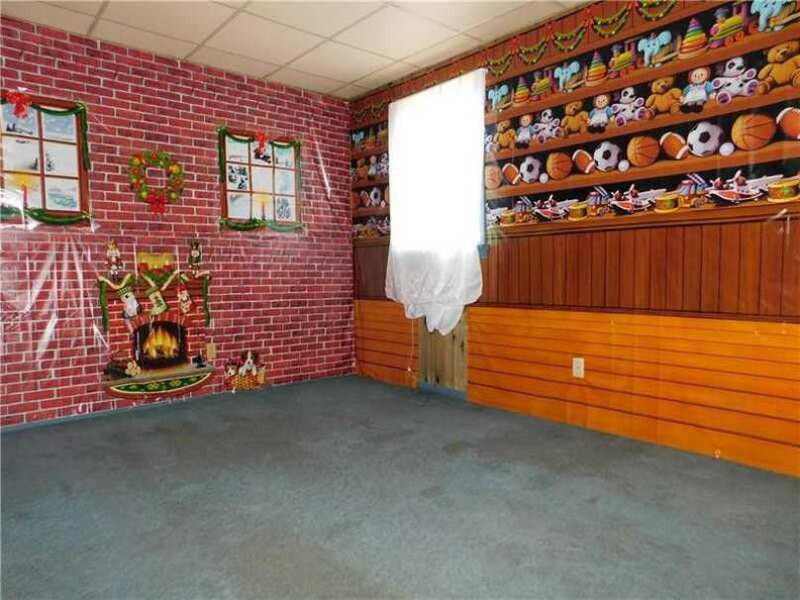 Is that brick wall with fireplace and dog wallpaper ??? Omg! I love this house lol! It’s just a plastic wall covering. 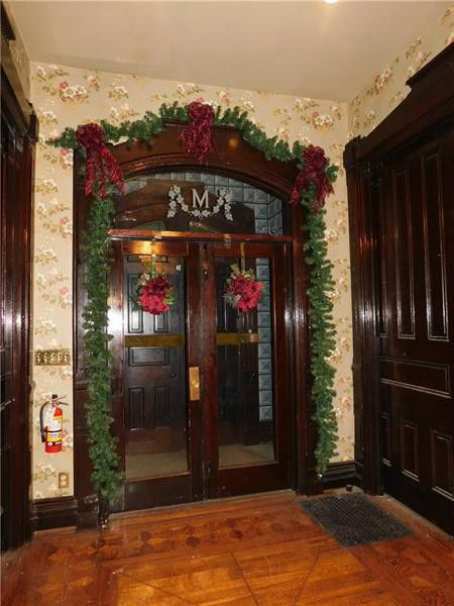 They had a walk through with Christmas trees in every room and some of the rooms had themes. Very cool! 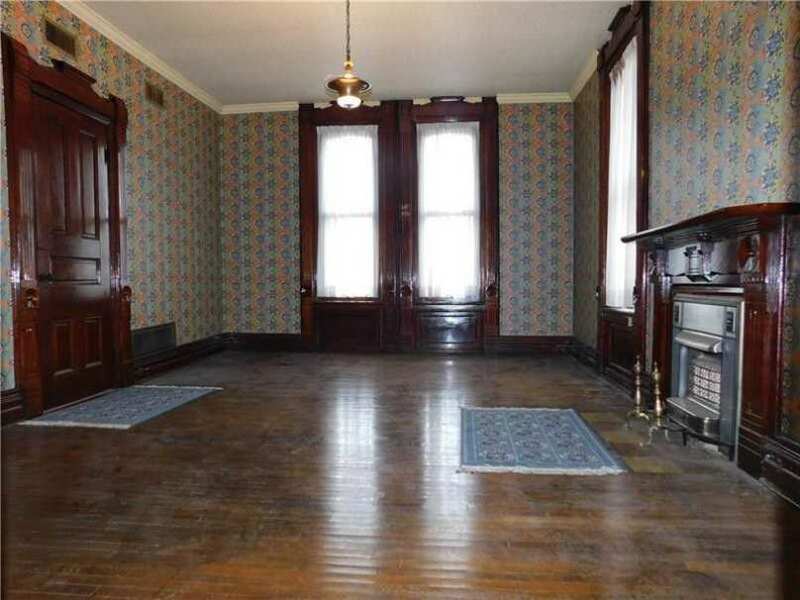 This house could be AMAZING. I love the verticality of the windows and doors. Is there an architectural term for the bay window in the 11th picture that site behind an arch? If not there should be because I love them. I hope someone with a good eye and gentle hand brings this back. I wonder how much it would cost to replace a tower? 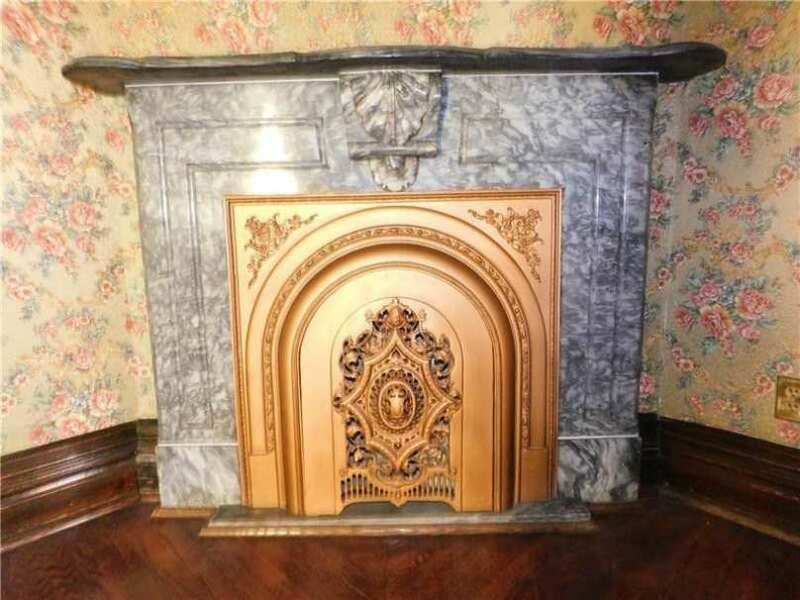 Love this house — look at that mantle! More mantles, eggplant room. This should be an elegant home, not a business. Somebody please take it on . . .
And all for but $58K!!!!!!!! I would soooooooooo recreate the original porch and missing tower top. This house is amazing! I cant say enough good things about it. It appears to be in some what good condition. I wonder if the backyard could be fenced off and turned back into a yard and partial parking spaces? Waa waa wee waa! Talk about drama! Even sans tower, this house is still a real stunner. Would you have the chutzpah to stand out on that balcony WAY up there? Heheheh. I’ll bet a nickel there is a picture somewhere (or once was anyway), of the original owner doing just that. 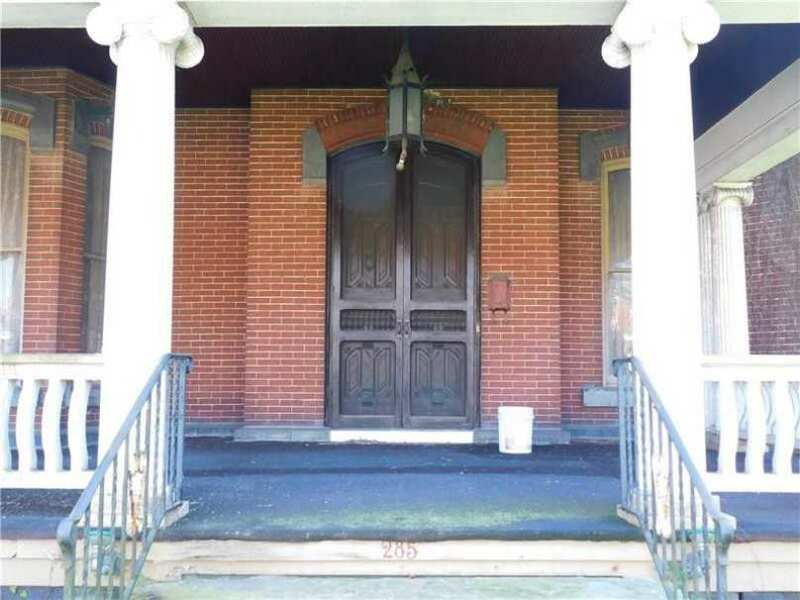 Has there ever been a more unfortunate porch? I’m afraid that big clunky sucker would have to go if it was mine; and I love porches. What a great rarity it is to see one of these top tier Empire / Italianates with it’s decadent interior still nearly perfectly intact! Look through just the ones from this year alone and see if you can find even one which comes anywhere near this fine state of preserve: most are essentially trashed. Even more amazing that it’s a multi in such good condition! 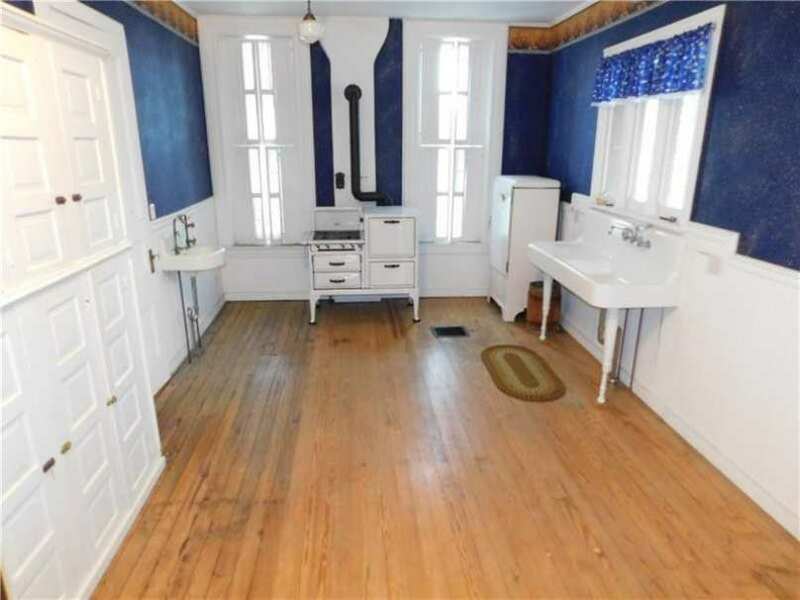 Howzabout that rad 20’s kitchen?! 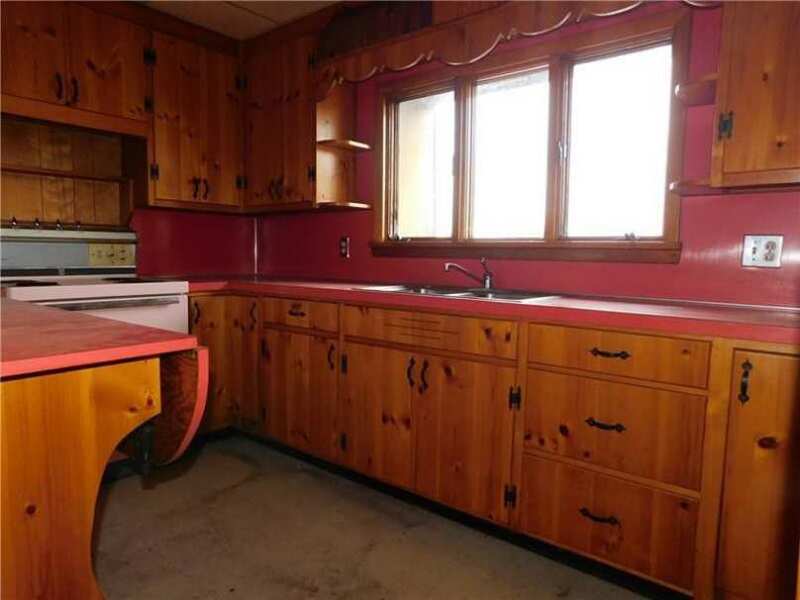 That’s about the extent of a kitchen back then: maybe a table and a Hoosier cabinet. Heheheh. 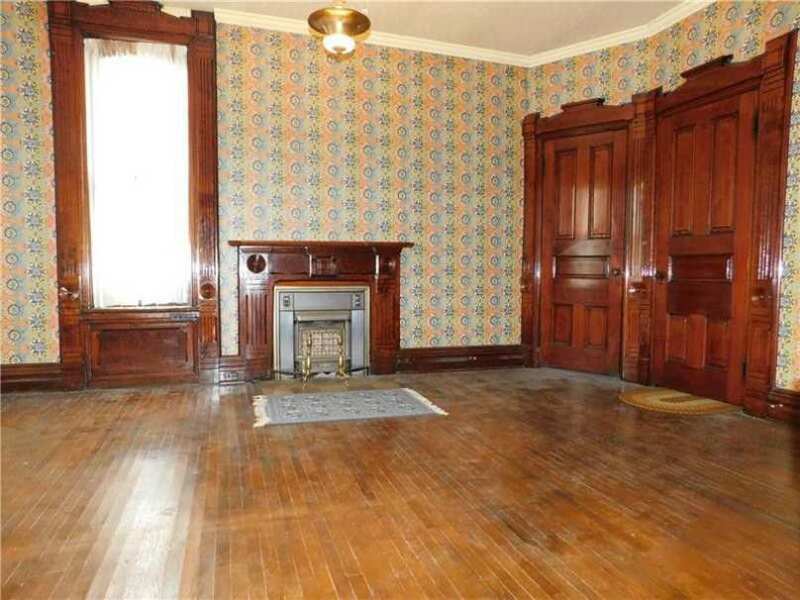 Don’t you think that the house is about 20+ years older than the interior woodwork. 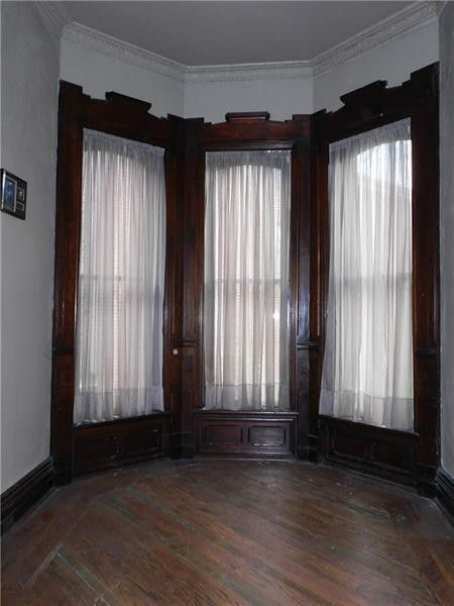 The stairs window trim and doors look to me to be more 1890, while the exterior looks 1860-70. The only real knowledge that I have about Second Empire is from this site, but I have also learned about the “updating that was done to bring it into the current fashion. I prefer the earlier, simpler woodwork style. Greenville is the home of Thiel College. A Lutheran affiliated liberal arts college founded in 1866. The Sheetz gas station catty corner across the street (street view) is a popular deli lunch stop for the students. (The college is down the street from it, right past the cemetery.) It’s not like any college town I’ve seen. The town doesn’t really embrace the college and student population. At least not when I worked there some years ago. The old downtown would be ideal for typical college town coffee shops etc. Being right on Main Street, it sadly seems likely this old beauty will remain some sort of business. Being so close to the college, I wonder if it would be feasible as a B&B. I LOVE that purple room! What a great house! Rosewater said exactly what I was thinking. I am usually disappointed after drooling over the outside then seeing a stripped inside but this interior is delicious. How I love the drama and extravagance of the design. I am giddy!! What gorgeous woodwork! Stunning! It cries out to be a SFH! I hope someone rescues her. She’s really special. And the price is so right! Was that a pink stove? I agree with all above, that this house is something special now, but after a good scrub and some redecorating, its going to be GRAND again! The only thing I would do really radical work on, is that clapboard thing on the back of the house. I don’t know if someone willy nilly added it on at some time, or what, but its the only sore thumb on this house I can see. This house needs to be worked on, and to once again become a home. It looks grand, but at the same time, its homey feeling, really comfy cozy somehow. OMG! OMG! OMG! I think I blacked out for minute!!! I LOVE THIS HOUSE!!!! I thought of Ross immediately…. 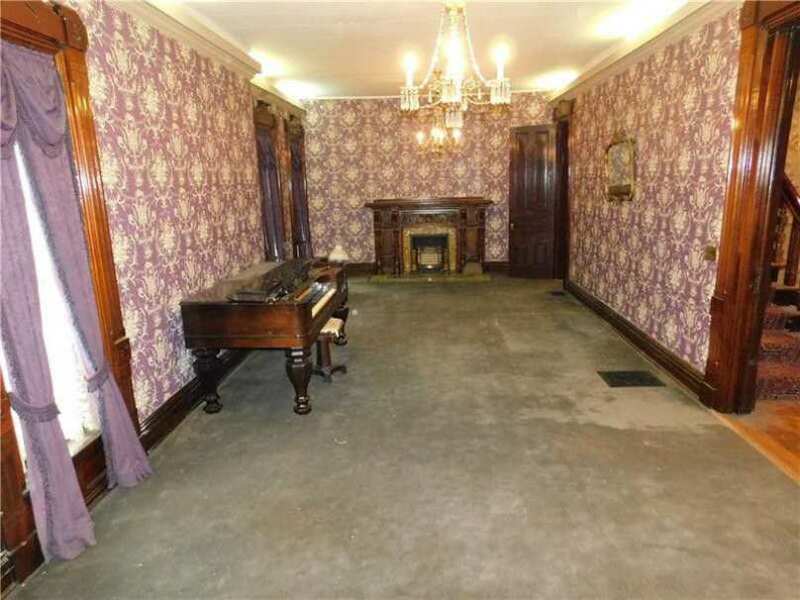 When I saw that piano in basically an empty house that dates to that time period I thought what a neat piece of history for this home if each owner since has left it intentionally? What a mash-up of eras and wood work colors but I LOVE it! 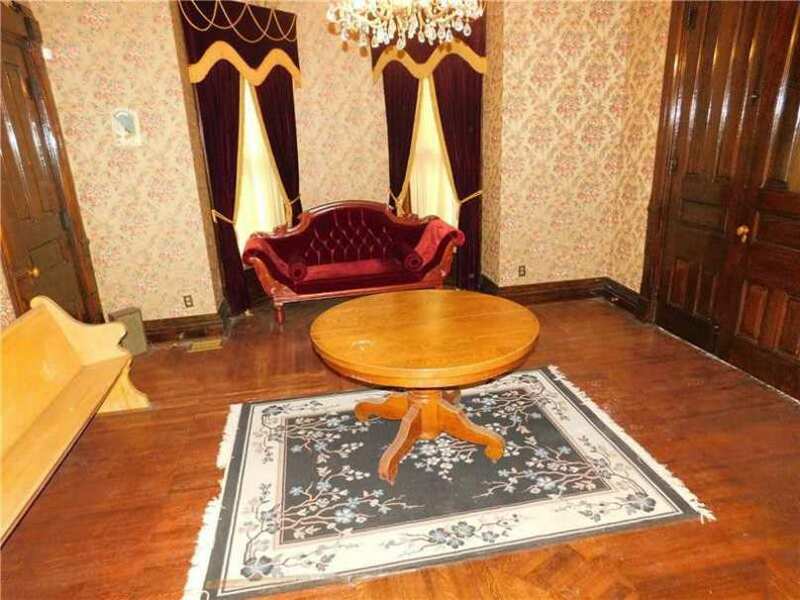 Undoubtedly, the 17th picture was the funeral home’s prep room. M is my last initial, so I think I get dibs. 😎 I’m blown away by this beauty. I just LOVE this house! If it were located closer to Iowa, I would buy it in a minute! 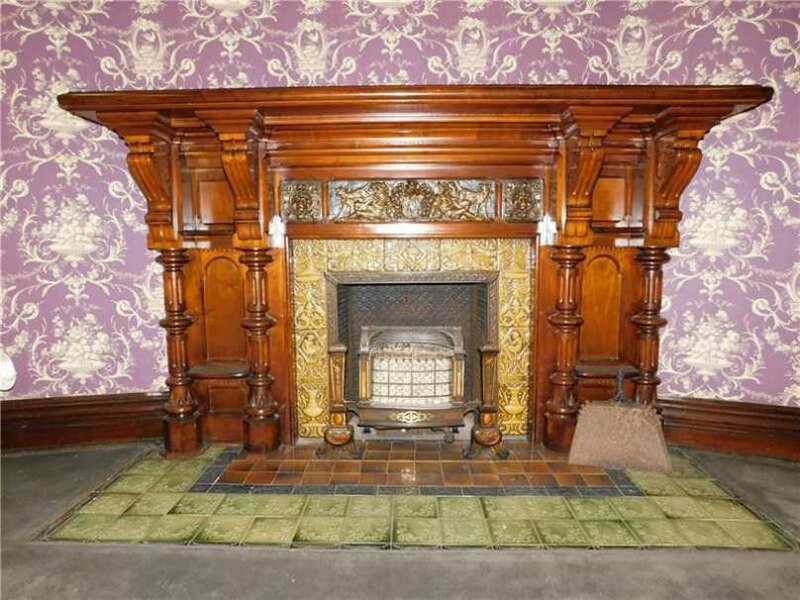 Remarkable home…the fireplaces! 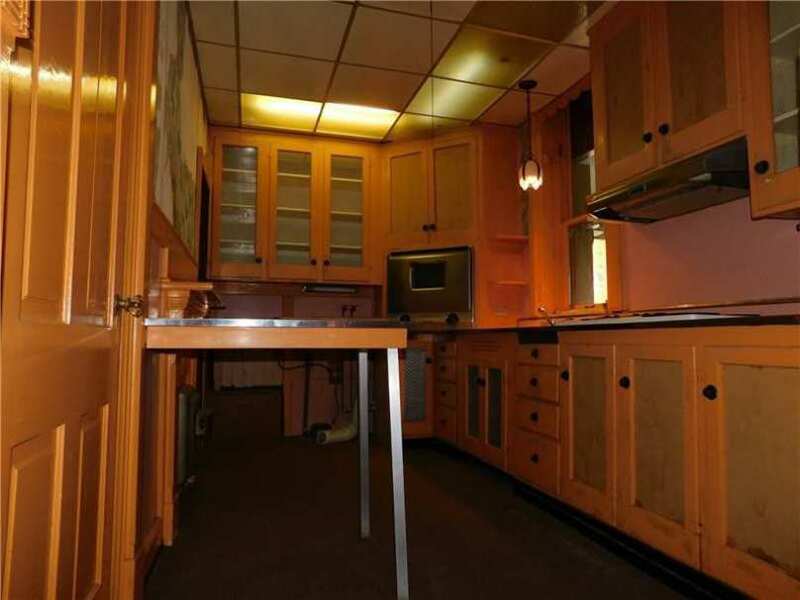 and no one mentioned the kitchen-the sparse almost original kitchen that looks like a museum! 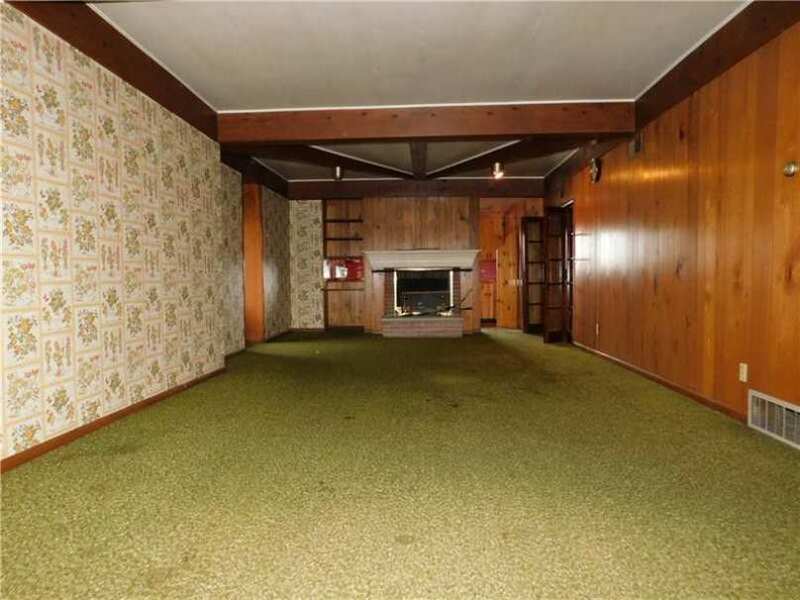 This house would have never made it to this site if I lived anywhere nearby. Tragically, for me at least, I live in California just now. This site has published several of his designs in the past. 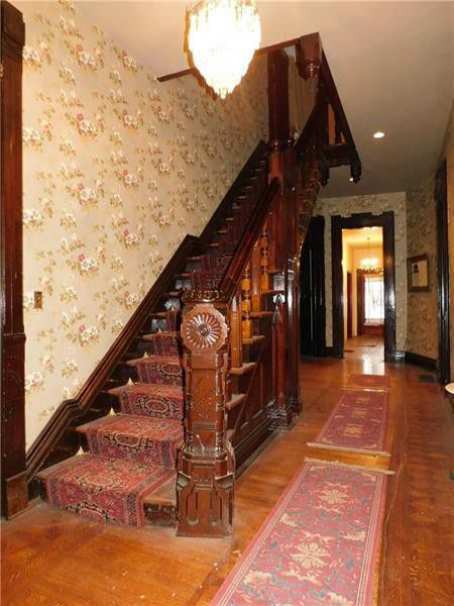 A good example of his work is the amazing W. M. Weigley mansion in Shafferstown, Pennsylvania. 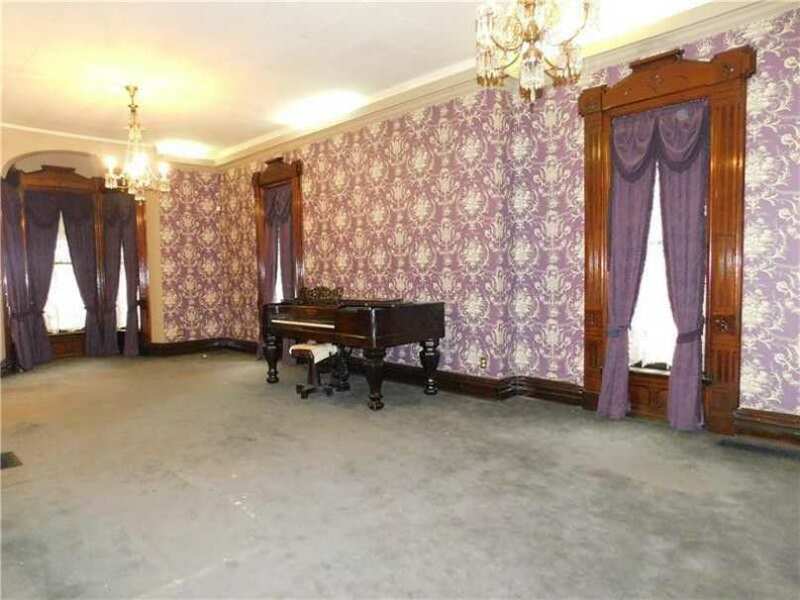 And I love the mid-1800’s piano. 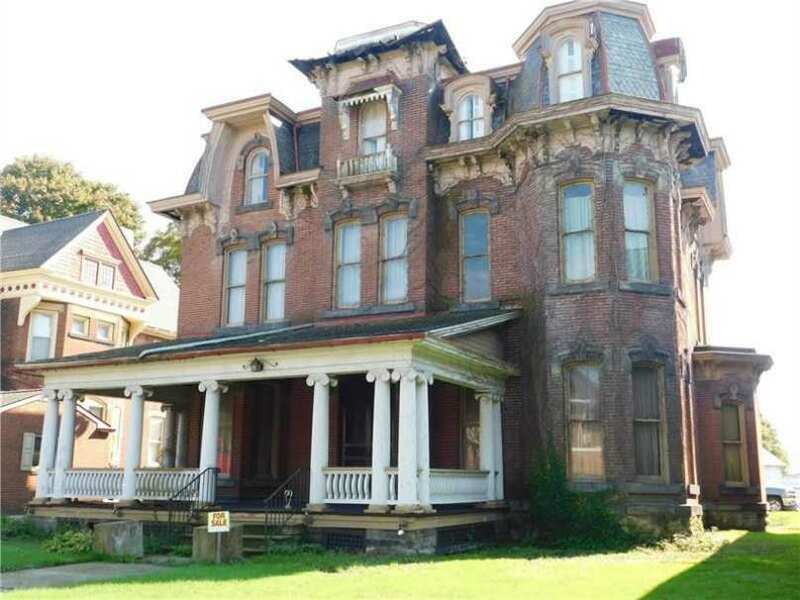 Here’s an Internet Archive (free read and download) 1876 edition of Hobbs’ Architecture from 1876: https://archive.org/details/hobbssarchitect00hobb/page/n3 I didn’t immediately find this design but there were numerous other Second Empire style house similar in details. It seem plausible for this house to have been designed by Hobbs or by one of his contemporaries. People buy square pianos and then find they can’t be repaired or played. If you want one as a piece of furniture, fine. They are extremely heavy and rolling one across an oak floor will put grooves in the floor. Our local piano mover charges $350 to take one away and recycle it. From the turned (not cabriole) legs on this example, it is not a Steinway or Mathushek, which are the only ones with any market value. The house is very good, but take a look at the eaves on the center tower. I’m sure there’s lots of that kind of repairs needed. Love this one. Such a beautiful character in her. Lordy this is beautiful but the elegant lady does need her hat back! OMG, What is with that town! Look at what they did to the house next door and across the street. It wouldn’t surprise me if something like that happens to this place too. Obviously a lot of the original homes on that street have been torn down for modern structures. The original street in the post card was so lovely. Very sad it’s all gone. Currently showing an open house on 11/17/18 between 11:00 AM – 1:00 PM. OMG I’m in the market for a Second Empire!! I need to see what gives RE the town. I just purchased a garage in Greenville, and was immediately struck by this home. The roof and gables appear to be the most concern. I wonder what the price would be for that? Greenville is a nice but somewhat faded city that, like this home, needs energy to bring it back. The town is home to Theil College, a very fine private institution, and has a wonderful railroad museum. The town also has an old Packard dealership for sale! 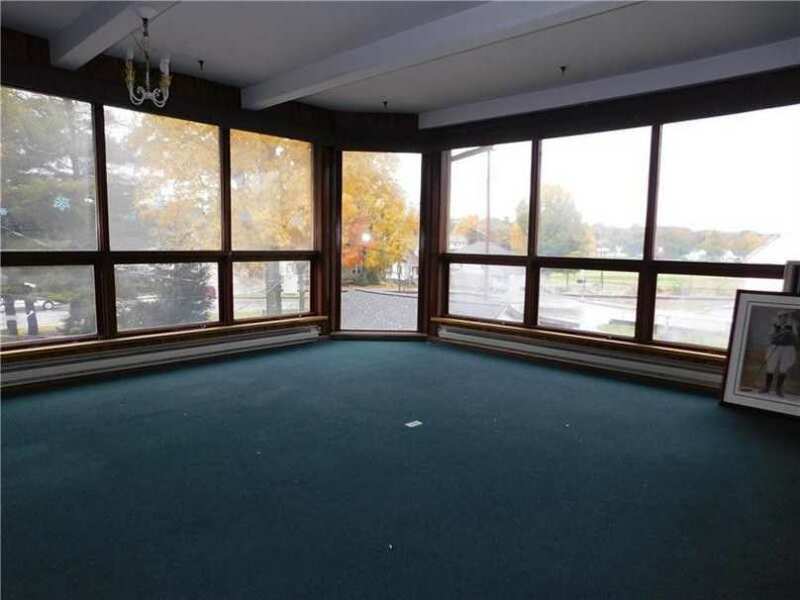 Though the porch is nice, it doesn’t fit the style of the house. My guess was that was updated later. Sorry if someone else discussed this. You would be correct! 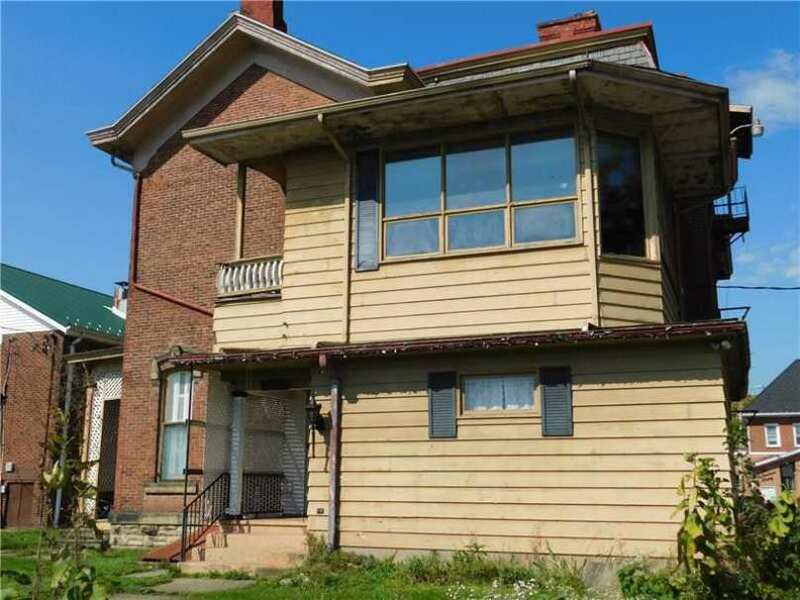 I did some digging into this house and found pictures of the front from 1903, 1913 and 1918, In 1903 the original front porch was there, from the picture I saw it had the same gables as the exterior. 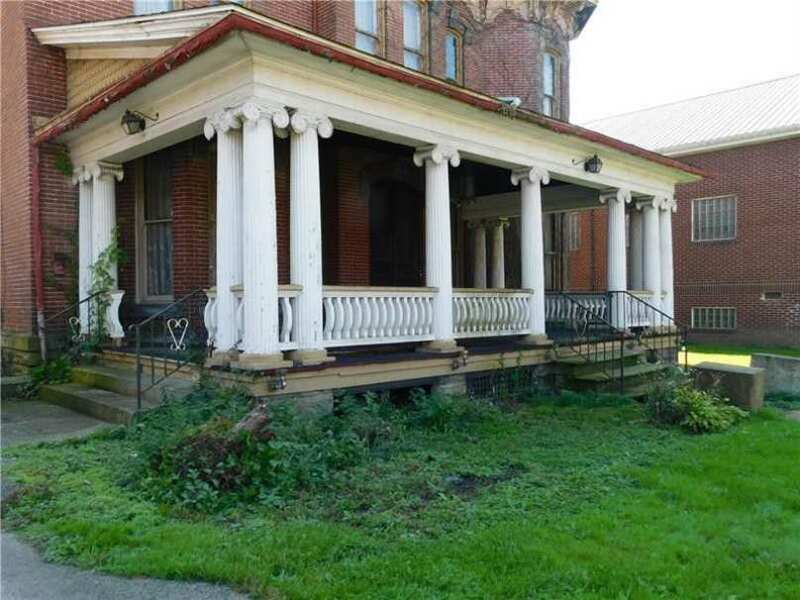 but some time between 1903 and 1913 the porch was updated to what we see today, this was the same time the back patio/porch was either added or updated as well.